where L is angular impulse, t is time, is specific impulse, g is gravitational acceleration and nipis propellant mass expended. A reaction wheel produces torque by changing its speed. Its angular impulse capability is equal to its moment of inertia times its maximum speed—its total angular momentum. A control moment gyro produces torque by changing the direction of its constant-speed momentum wheel. The angular impulse capability of a CMG is its momentum (wheel mass moment of inertia times speed) times the angle through which it can be moved. The relation between momentum and weight and power for wheels and CMGs is presented in Table 10-20. For a spin-stabilized spacecraft, angular impulse is required for spinup, spin maintenance, and spin-axis precession. If the spacecraft is spin-stabilizeid for only part of its mission (such as during kick-stage thrusting), then impulse is also needed for despin. TABLE 10-20: Weight and Power of Components In an Attitude Determination and Control Subsystem. Note 7"s Torque In N -m, and Ha angular momentum In N -m -s.
where L¡p^ is the impulse required inN-m-s,^ is the spacecraft moment of inertia about the spin axis in kg-m2, and Qs is the spin speed in rad/s. Typical values of spin speed range from 0.1 rad/s for spacecraft requiring minimal spin stability to 10 rad/s for stabilization during kick motor firing. Impulse required for despin is computed with this same equation. Note that the inertia of the spacecraft during despin may be different than during spinup. The principal merit of spin stabilization is that it is passive; that is, a spin-stabilized spacecraft will remain spinning at constant rate with its spin axis substantially fixed in inertial space. However, if the spacecraft has a thrusting mode such as kick-stage firing or throster firing for velocity correction, both the spin speed and the spin axis orientation may be changed. Disturbance torques as presented in Table 10-18 may also make spin corrections necessary. If the offset is in the direction that changes the spin speed, then impulse will be required to correct spin speed. If the offset is along the spin axis, the spacecraft angular-momentum vector will precess, thus changing the orientation of the spin axis. In either event, impulse is required to correct the unwanted change. If spin-speed correction is required, the impulse is about the spin axis and if precession is involved, it is normal to the spin axis. Typical thruster alignment tolerance is 0.1 deg. This tolerance, coupled with centra1 of mass uncertainty, leads to typical thrust-axis to center-of-mass offset of 0.002s-0.01i where $ is the distance from the thruster to die center of mass. where Iss is the mass moment of inertia about the spin axis, Qs is the spin speed (in rad/s) and a is the angle of rotation of the spin vector in radians. The total angular impulse is converted to propellant weight through the use of Eq. (10-10). Typical weight and power for attitude control components are summarized in Table 10-20 and discussed in Sec. 11.1. Actuators and wheels are available in a large number of sizes and capabilities. Their weight and power as a function of torque may be estimated by the relations given. The communications subsystem receives and demodulates uplink signals and modulates and transmits downlink signals. The subsystem also allows us to track spacecraft by retransmitting received range tones or by providing coherence between received and transmitted signals, so we can measure Doppler shift Table 10-21 summarizes the main system considerations which drive the design of communications subsystems. TABLE 10-21. System Considerations for Design of Communications Subsystems. Communication access to a spacecraft requires a clear field of view for the spacecraft antenna. It also requires sufficient received power to detect the signal with acceptable error rate. Access across many viewing angles demands an antenna with a wide beamwidth, so good spacecraft designs always include an antenna system that can receive signals over at least a hemisphere. The gain of a widebeam antenna is low—typically 0 dB for hemispheric coverage. Therefore, we must select a level of transmit power and a receiver sensitivity that allow us to detect signals with an acceptable error rate. 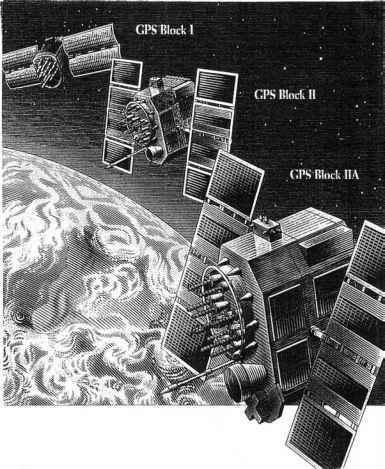 The spacecraft receives data consisting of commands and range tones. Command rates range from 100 bits/s to 100 kbits/s, with most systems below 1,000 bits/s. The data rate depends on mission considerations and sets the communications subsystem's bandwidth, which establishes the received power required to detect signals (Chap. 13). For spacecraft communicating directly with ground terminals, received signal strength is not a design driver because we can set the ground terminal's transmitting power as high as necessary. However, received signal strength from a relay satellite does affect the communications subsystem's receiver sensitivity and maximum data rate. Systems that require data communications at rates greater than 1,000 bits/s normally use high-gain, directional antennas and can operate at low bit rates to allow wide-angle access when needed. The downlink signal consists of range tones, telemetry for spacecraft status, and payload data. The baseband data is normally digital and multiplexed by frequency or time. Telemetry to report the spacecraft's status operates between 100 bits/s and 1,000 bits/s. If the downlink handles only status telemetry, or if the payload data will fit within a low-bandwidth link, we can communicate using a widebeam antenna. Data communication over a high bandwidth usually requires a high-gain, directional antenna and a low-bandwidth mode for widebeam coverage. Table 10-22 shows how we size the communications subsystem. To do so, we must identify the data bandwidths of the uplink and downlink, select communication frequencies, prepare RF power budgets for both links (Chap. 13), and select equipment. The basic communications subsystem consists of a transmitter, a receiver, a widebeam antenna, and an RF diplexer. We may also use a high-power transmitter or a directional antenna if the data rate requires it. TABLE 10-22. Steps In Designing a Communications Subsystem.